Setting up your Online Store theme lets you quickly change and fine tune your site's overall look. Click the Store Design tab and then click the Theme tab. Your current theme displays on the left; click Change Theme. Once you find a theme you like, click Choose this theme. 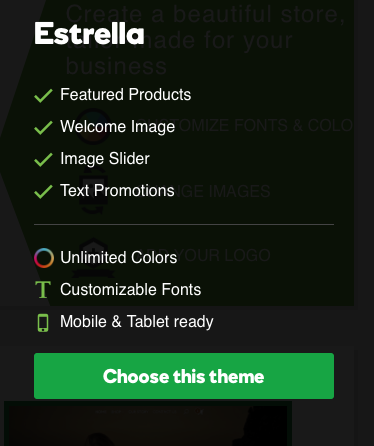 You can then edit the My Theme Settings by clicking the + for each section. Site Header: Under Announcements add a Message to display text, and a URL to link to a specific web page. Home page: Add a Main image to replace the theme's image, and fill out the relevant information. Product display: You can choose to display up to 12 featured products on your home page. Click Save to apply any changes to your store's design. For a video about using themes, see Managing Themes and Settings in Online Store.